As part of a repair job 3,300 years in the making, Harvard’s Semitic Museum is seeking to undo some of the destruction wrought when Assyrians smashed the ancient city of Nuzi in modern-day Iraq, looting the temple and destroying artifacts. 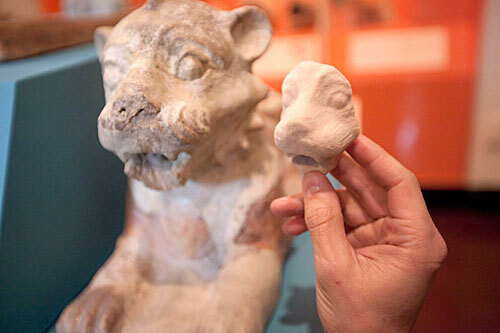 In a high-tech project that would have been impossible even four years ago, technicians are attempting to re-create a 2-foot-long ceramic lion that likely flanked an image of the goddess Ishtar in a temple in long-ago Nuzi, which is the modern archaeological site of Yorghan Tepe. The project will blend fragments of the original statue held by the museum with pieces created through 3-D scans of its intact mirror image, which likely sat on Ishtar’s other side. Adam Aja, assistant curator of collections, carefully examines a piece of the model. Museum assistant director Joseph Greene said the project is partly driven by the desire to re-create the damaged lion and partly by a commitment to use the latest technology to probe the thousands of artifacts in the museum’s collection in search of new data from them. The museum holds just two pieces of the fragmentary lion, its front paws and a larger chunk of rump and back legs. Technicians from an outside contractor, Learning Sites Inc., visited the museum Friday to take digital photographs of the fragments to augment more than 120 images taken of the intact statue. According to Donald Sanders, Learning Sites president, the 3-D models are made using the digital photos and sophisticated computer software that knits the images together. The images can be taken with ordinary cameras and even cellphone cameras, but they have to overlap, so that the software can sort and match the images to create the model. The more overlap there is, he said, the more data points the software has, and the more detailed the model can be. By taking more than 120 images of a relatively small statue like the lion, the resolution can be less than a millimeter. A detail from the face of one of the statues. The temple where the lions originated likely contained at least four such statues, two standing and two crouching, flanking an image of the goddess Ishtar, according to Adam Aja. The result, Sanders said, is a 3-D image that can be called up on a computer screen, rotated, zoomed in and out, and examined in detail by scholars off-site, providing accurate access to a museum artifact that they might otherwise have had to visit Cambridge to see. For display purposes, the digital models can be “printed out” on sophisticated, 3-D machines that sculpt from high-density foam. The software will attempt to use the 3-D model of the intact lion to re-create the missing parts for the broken one. The intact original will be returned to its owner, the University of Pennsylvania, next year when the Semitic Museum’s second-floor exhibition hall is closed for renovation. The temple where the lions originated likely contained at least four such statues, two standing and two crouching, flanking an image of the goddess Ishtar, according to assistant curator Adam Aja. The two standing statues, owned by the Harvard University Art Museums, and the crouching lions have been on display at the Semitic Museum since 1998, the first time they’ve been together since the late Bronze Age destruction of the temple, Aja said. Nuzi was inhabited by people called Hurrians near modern-day Kirkuk in Iraq. The city was destroyed by the Assyrians sometime between 1350 and 1300 B.C. Lions, which once roamed the area, were considered symbols of power, and reliefs depict rulers going on lion hunts. The statues and their re-created models will be taken off display next year when the gallery is renovated, but will be public again when the work is completed, probably in 2014.